Jason’s Deli is one of my favorite places to eat. They have such fresh, healthy, and even some organic foods. I have a couple of girlfriends who have birthdays within just a few days of mine. For the past three years, we have met at Jason’s to visit and celebrate our birthdays. It’s also a time we catch up with each others lives. Another great thing about Jason’s is that you don’t have to rush. We can take our time and enjoy visiting, even if it’s for three hours! This entry was posted in Family & Friends, Organic Products and tagged Jason's Deli fresh food, organic food at Jason's Deli by Charla. Bookmark the permalink. I can’t remember the last time I ate at Jason’s Deli! I think they have wonderful sandwiches and great soup. Today would be a great day for a good bowl of soup, it’s cold and rainy, so maybe I can convince my family to head out to Jason’s for lunch! 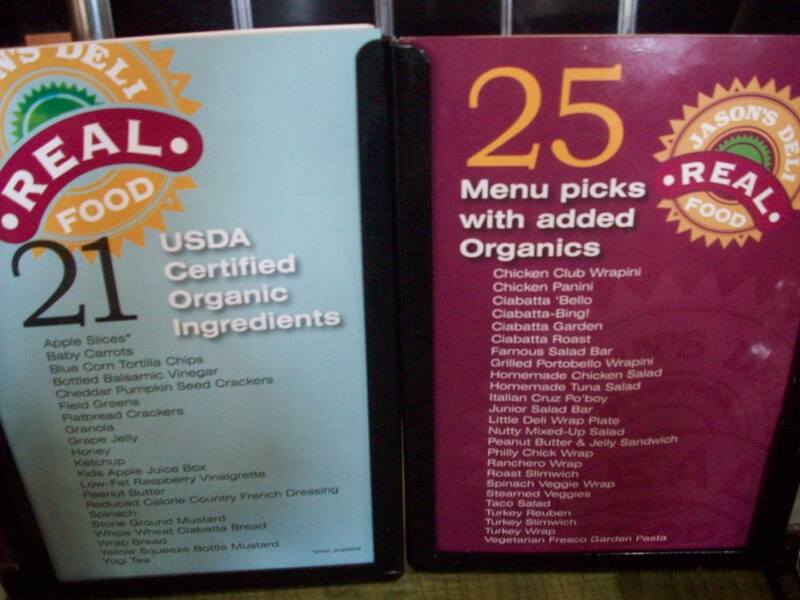 We love Jason’s Deli for their healthy options and their child-friendly atmosphere. Our 2 1/2 year old loves going there! .-= Christi´s last blog ..Decorating on the Cheap: Chalkboard Border =-.